In 1790, Lady Henry Fitzgerald (1769 – 1831) claimed the title of the ancient barony de Ros (pronounced roos) by petition to George III. She was opposed in this endeavor by His Grace, the Duke of Rutland, and the matter was referred to the House of Lords. The Lady versus the Duke. Sounds like a Regency romance in the making. I always liked these covers. Sophisticated and subtle. Cruise’s Treatise is an excellent source of the law of peerages as it was understood during the Regency period, particularly with regard to the king’s power to make or break titles. Not only does it contain a comprehensive table of cases, it also provides the mode of procedure for acquiring a title–especially helpful when a character in one’s book desires one. The following blog posts will be concerned with baronies in particular, and how the lady got hers. 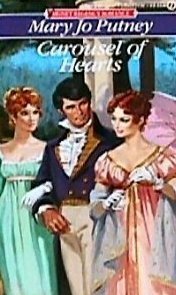 This entry was posted in Regency, Uncategorized and tagged abeyance, baronies by writ, Barony de Ros, Duke of Rutland, Lady Henry Fitzgerald, peerage law, Regency era titles by Angelyn. Bookmark the permalink. I have read many Putney novels. Guess I missed this one and will need to borrow it from you! I think you’ve discovered two great romance titles: The Lady vs. the Duke and How the Lady Got Hers, lol. Maybe even How the Baroness Got Her Groove Back. Ugh…better stop myself. Can’t wait to read this post series! Oh! You make me laugh–if the title has duke, or baroness in it, that’s marketable stuff!